The following is partially taken from the 1981 issue of The Tracker (journal of the Organ Historical Society). Extant old organs are not numberous in northeastern Minnesota. Of the few which remain in the Twin Ports area, the one at Sacred Heart Church is the best known ... by far the most impressive old organ in the entire state. The overall tonal effect of the organ is greatly enhanced by the excellent acoustics of the building, as well as by its placement in the back balcony. The Felgemaker organ remains almost unchanged in the back gallery where it was installed almost  years ago. Needed alterations have been largely mechanical and have not affected the tonal qualities of the organ. A slightly concave pedal board has replaced the original straight one. Althought the 'bellows signal' drawknob remains on the console, the hand pump, long since removed and lost, has been replaced by an electric blower. The organ is in good playing condition. 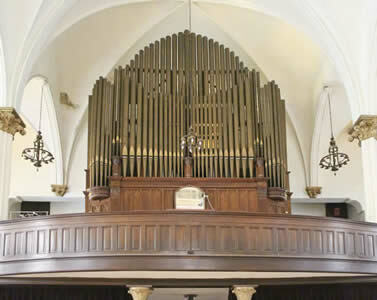 A two-manual 26-rank organ with 1493 pipes, the Sacred Heart organ is among the last trackers built by Felgemaker. It is one of the few surviving organs with Barker levers which facilitate playing when manuals are coupled. Another somewhat unusual feature is the Trumpet ranks with its nickel plated shallots designed to keep reeds free of dust and other foreign materials. © 2018 Wahl Organbuilders. All rights reserved.